The popularity of sweet potatoes has risen in the last few years and that is for all the right reasons. Sweet potatoes are tasty, nutritious and really good for you. No wonder more people search for healthy sweet potato recipes online. 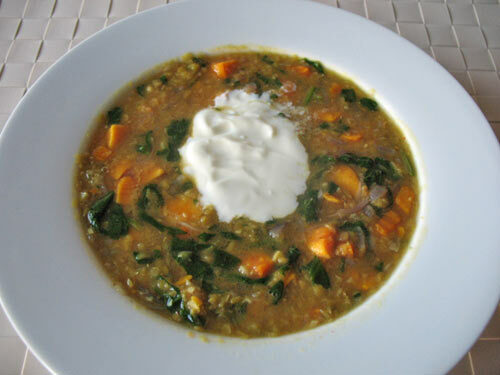 I’ve already shared a sweet potato soup recipe on my blog and today I am sharing jacket sweet potato recipe with a delicious filling that is rich in protein and full of flavour. The recipe has been created by Ben who writes about food and blogs over at The Eat Down. I have a confession: I’m a sweet potato addict. Something about the root vegetable has meant that it’s become a common staple at mine. I’ve even been known to plan entire meals around sweet potatoes. And why wouldn’t I? Not only are they sweet (it’s all in the name), but they’re beautifully sticky and steamy when baked whole, and lovingly crunchy when cooked in chunks. Whether they’re served whole, mashed up, or cut up into fries, they make a great and healthy way to add some much-neglected carbohydrate to the side of your plate. I will admit though that they need dressing up, so this over-stuffed sweet potato recipe today is the perfect opportunity to enjoy a hearty serving of sweet potato, with a beautiful tasty filling stuffed inside it. 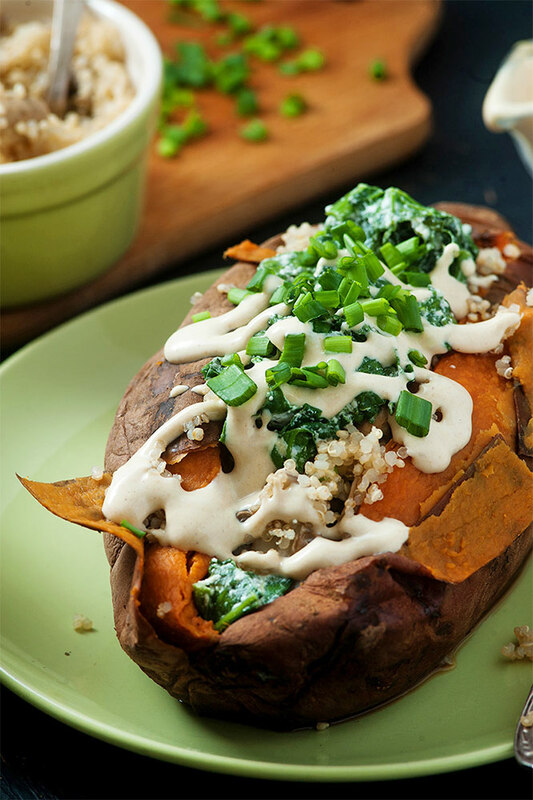 This sweet potato recipe attempts to replicate the hearty flavours of a regular jacket or baked potato, but does so with far healthier ingredients than the baked beans and cheese you might normally associate with the meal. Instead of that, we’re making use of a beautiful quinoa and sauteéd mushroom mix, along with a kale salad and chives. I’ve seen some stuffed potato, whether it be regular potato or sweet, call for removing much of the flesh of the potato in order to accommodate your filling. But I love the flesh of sweet potato so much that I’m not going to do this. Instead, we’re going to cram in what we can of our mix, to give a filling yet healthy over-stuffed potato. Today I’ve gone for a quinoa and sauteed mushroom mix, but the truth is that you can experiment with your toppings. You might prefer black bean salad, goats cheese, or even shakshuka. For this recipe, our filling is made of three core parts: Our quinoa mushroom mix, a simple kale salad, and a vegenaise sauce. I’ve laid out exactly how to make all of these below, but feel free to improvise with your choice of kale dressing, the spice for the veganaise, or salad ingredients. 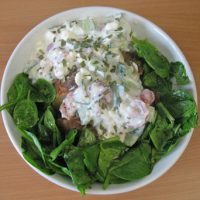 If you would like it to be vegan throughout then vegan-friendly mayonnaise (or ‘vegenaise’) is widely available in shops. If you would prefer to skip the mayo, then low-fat Greek yoghurt is a great alternative. For your choice of spice, I have mentioned sriracha as a possible ingredient (I’m a bit of an addict). However, lots of low-sugar hot sauces alternatives are available. The recipe uses quinoa. I find a lot of people go by different raw quinoa-to-water ratios, so if you have never made it before then I recommend starting with this simple recipe. Depending on how crazy you go, you may well find that you have leftover salad, quinoa or sauce. And that’s it! Be sure to let me know and tell me what kinds of fillings you’d like to try. 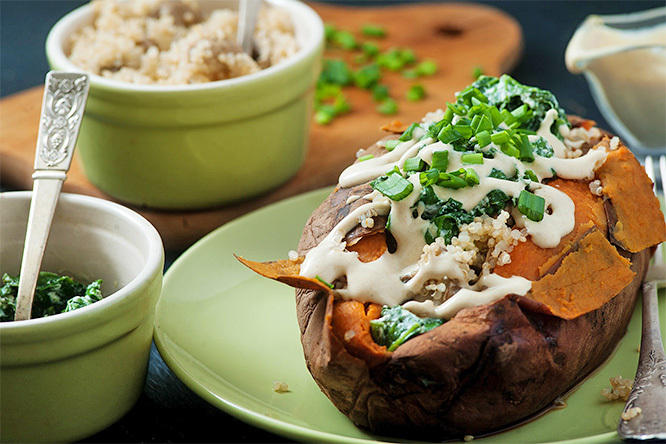 Vegetarian baked sweet potato with protein-rich filling, can easily be vegan. Preheat your oven to 180ºC/350ºF. Prepare the sweet potato by cleaning it, and pat drying it down. Rub olive oil on its skin, and transfer your potato to a baking tray lined with tin foil, oil, and salt. Once your oven has reached your target temperature, put your sweet potato in the oven. Bake for 40 minutes. While the potato is cooking, it’s time to prepare our fillings. First, cook your quinoa. You might have microwave quinoa, or quinoa ready to boil. While the quinoa is boiling, lightly sautee your mushrooms in a pan. Do this by heating 1-2 tablespoons of oil in a pan. Use butter or ghee if you prefer (if you are not vegan). Cook the mushrooms on a light heat for about 5 minutes, or until brown and tender. 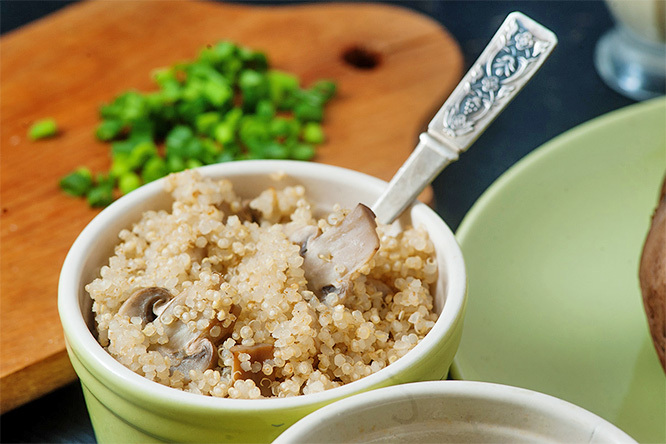 Drain the quinoa once it’s ready (after about 15mins) and combine with the sauteed mushrooms in a bowl. For the salad, mix the kale salad ingredients in a bowl and toss with your chosen vinaigrette. For your sauce, mix the vegenaise (or other vegan mayo), maple syrup and your choice of hot sauce, sriracha or chipotle powder in a small bowl. 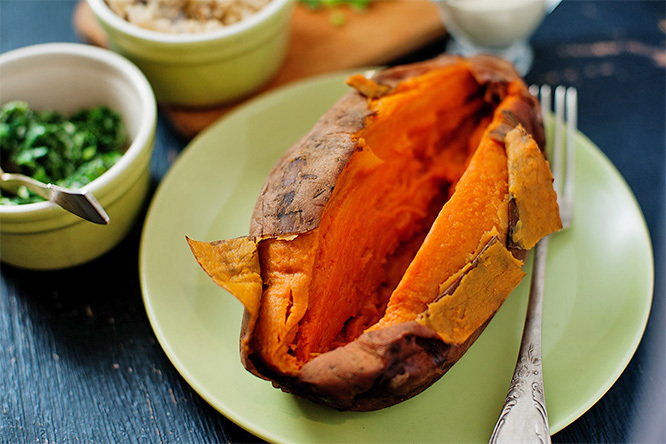 Once your sweet potato is ready, remove from the oven and sit down the middle to allow you to open it up. Allow to rest for a couple of minutes. Add your fillings. I recommend adding the quinoa-mushroom mix first, followed by the kale salad, then the sauce. Season with salt and pepper if needed.